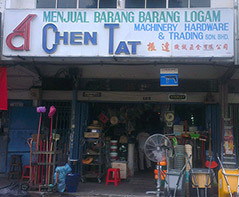 Chen Tat Machinery Hardware & Trading Sdn Bhd is a reliable machinery & hardware supplier company. Our company is located in Port Klang, Selangor. We provide high quality industry supplies such as port equipment and oil & gas equipment for our customers that help them in their daily life. We are the authorised distributor for Seamaster paint, Dulux paint, Nippon paint, Jotun paint, Stanley, Proto, Elora, and Ridgid. Besides that, we also supply Yale security lock, Abloy security lock, Solex security lock, welding equipment, metal, and building material. At here, you are able to search mostly all kind of machinery product that you are desire. To better serve our customer, we strive to supply more effective machinery to meet market demands in the future. In additional, our staffs are highly experiences in whether serving customer and product knowledge. We are ever ready to assist you anytime you need. If you are interested in any of our products or would like to discuss a custom order, please feel free to contact us. We'll get back to you within 24 hours!